Health economist David Meltzer does the math on cost-effective medicine, hospitalists, and more. All of the above: not choosing between medicine and economics earned Meltzer a career in both. With his future-costs theory hammered out, Meltzer flew to Phoenix. He returned feeling a little shaken. That’s putting it lightly. 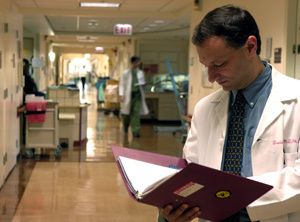 Since 1996, when Meltzer finished his residency and joined Chicago’s faculty full time, he’s studied cost-effectiveness relating to patient preferences, simultaneous health problems, medical-research priorities, Medicare policies, physicians’ learning processes, technological advances, and the “spillover effects” that illness imposes on patients’ families. 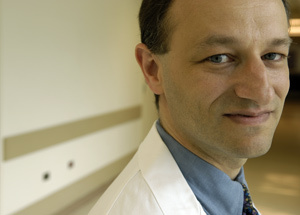 More than 15 years after he began studying prostate-cancer screening, Meltzer and his colleagues continue to gather data and refine their conclusions. For several years he’s asked a similar question of intensive treatment for type 2 diabetes: for whom is it worthwhile? Intensive treatment requires more pills and insulin shots than conventional therapy—and can cause more frequent low blood-sugar episodes. “On average, the people who choose it benefit from it,” Meltzer says. But for many seniors, the side effects supersede the remedy. “Applying it indiscriminately to older people, ignoring their preferences,” he says, doesn’t make medical or economic sense. Doctors and patients, says Meltzer, need to be more selective about how and when to use medical innovations. Hospitalist Chad Whelan is one of those people. 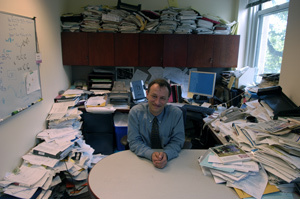 He arrived at Chicago six years ago as a clinician and educator; Meltzer helped him become a researcher and, eventually, an administrator. Now he directs the year-old Hospitalist Scholars Training Program, which hires internists as junior faculty for two years and combines their clinical work with research and social-sciences coursework. He also sits on several Medical Center committees, chairing the health-information management committee and serving as a “physician champion” for implementing electronic medical records. He researches pain measurement and management, gastrointestinal bleeding, and the decision-making resources available to physicians. Whether convening meetings between scientists and sociologists or converting calculus to algebra, Meltzer brings his own agility to medical problem-solving. Small wonder that this October, 11 years after his contentious presentation to the Society for Medical Decision Making, he begins a term as the group’s president.